More than 100 people gathered for a late afternoon, rush-hour rally outside Philadelphia City Hall on Sept. 29 to demand immediate humanitarian relief for storm-ravaged Puerto Rico. Initiated by Diaspora in Action, a loose collection of members of Philadelphia’s Puerto Rican community with strong ties to their island nation, the rally followed a week of organized events to collect material aid for Puerto Rico. 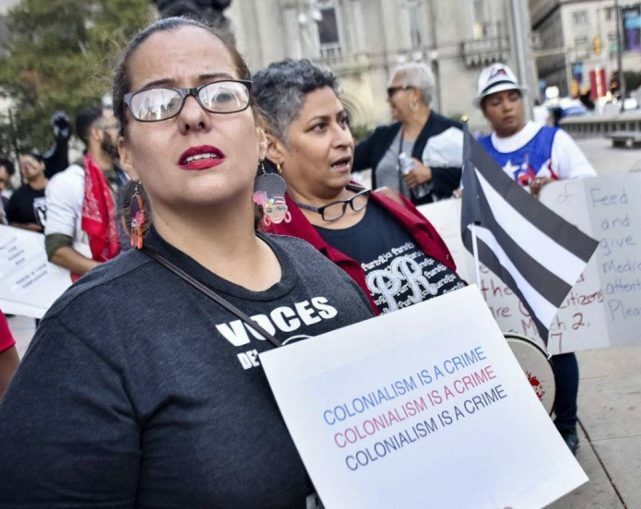 While organizers sought to increase public awareness of the humanitarian crisis their friends and families are suffering under, several speakers also addressed the century-old impact of imperialist colonization that is behind the crisis. Many participants carried signs in English and Spanish calling for cancellation of the $123 billion dollars in debt currently faced by Puerto Rico (Forbes, June 1, 2017), and for reparations for the island. Speakers repeatedly challenged President Donald Trump’s excuses that as an island it was just “too difficult” to get support there. They pointed out that when the U.S. conducted military operations on Puerto Rico’s archipelago island of Vieques, they never had a problem getting ships there. Former Philadelphia City Council member Angel Ortiz criticized the U.S. government for abandoning the people of Puerto Rico and trying to starve them out, as a part of the continuing land grab by Wall Street interests. He urged repeal of the Jones Act, passed in 1920, which mandates that only ships registered in the U.S. can carry goods by water between U.S. ports.